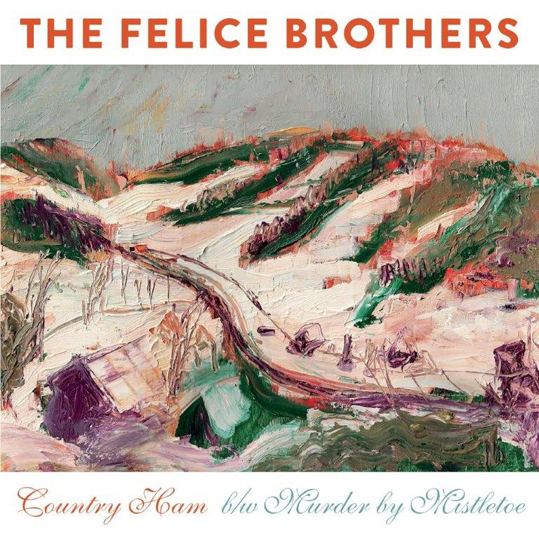 The Felice Brothers will release a limited edition 7-inch vinyl recording of “Country Ham” on 9th December via Yep Roc Records. The holiday-themed single features a live version of “Murder By Mistletoe” – recorded for Rolling Stone last year in NYC – on the B-side. Both tracks have never before been pressed on vinyl and pre-order is available now through The Felice Brothers and Yep Roc stores. “It’s a narrative about feeling lonely on Christmas, and the different emotions that can go with the holidays that aren’t always talked about in the happy-go-lucky songs.” Ian Felice says. The artwork for “Country Ham” is a nod to the band’s hometown, which features an original painting by Ian titled Palenville in the Snow. And here it is..